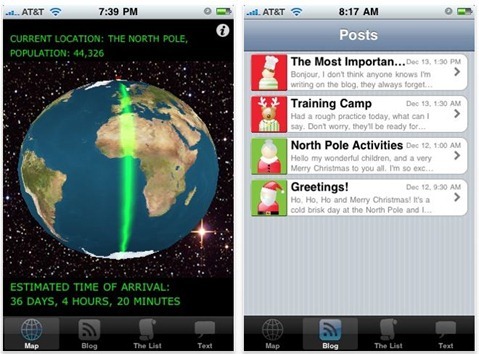 Santa Tracking app for the iPhone and iPod touch is finally here! It’s that time of the year again when you want to track the route of Santa to know where he is as he travels around the world, bringing nice presents for children. With Santa Tracker 2009 app, you can track Santa via GPS on your iPhone on 3D maps just like you can using NORAD’s. You can even text him, or check what’s on his nice and naughty list. Santa Tracker 2009 enhances the magic of Christmas for the entire family! This app will make you want to believe again! Track Santa around the globe with GPS, read his blogs, text him yourself, or even check out who is on the naughty or nice list. Features of Santa Tracker 2009 for iPhone are as follows. This app is available on the iTunes App Store for US $0.99. You can grab it from the download link given below.